Asides food, shelter and clothing, getting an education is one of the foremost heart desires of every parent for their children. Every father and mother wants her kids to get the best education money can buy on the planet. In fact you can say that getting an education is a mandated tradition in Nigeria such that regardless of the income range of the family, parents want their kids to go to school and “become somebody in life”. Education is so important that statistics has shown that 30% of the earnings of every family go to the payment of school fees at different levels and carders. With the drastic increase of children who are of schooling age comes the need for nursery and primary schools to cater for them. And this leads to continual financial gains for already operating nursery and primary schools in Nigeria. In Nigeria, individuals are allowed to own and manage educational institutions as long as there are no financial expectations from the government to these individuals. In other words, you are allowed to build and run your “private school” if you have the resources and requirements to do so. Before we jump into how to start a nursery and primary school in Nigeria, let’s talk about the advantages/ benefits the private school has over government owned schools. Academic Performance – Excellent academic performance is the major advantage private schools have to public or government schools. This is because private schools have more experienced and dedicated teachers who are willing to go the extra miles to harness the individual potentials of their students. This is not usually the case in government-owned schools. Student Size – There are fewer students in privately owned schools than in public schools. This is to say that with the limited number of students in a class, there is room for excellent teacher-student relationship. Hereby, bringing to light the strength and weaknesses of each student. This is not the same for public schools where the ratio of teachers to students don’t add up. You can find one teacher handling a class of 200 pupils in a class meant for 30. Discipline – Private schools are seen to have rules, regulations and code of conduct that must be strictly adhered to by all students. Defaulters are easily found out and dealt with appropriately. At the long run, alumni of private schools are more disciplined than their counterparts who graduated from public/government schools. Strike Actions – Strike actions are common features of public schools where academic and non-academic staff are revolting non-payment of salaries, low income, poor infrastructure or whatever they don’t like. This disrupts academics for weeks or months for government owned schools. Strike actions or labour strike is absent in the private schools sector. Hence is no disruption of the academic calendar. These advantages are the motivating factors that make parents enroll their children in private nursery and primary schools. For these reasons and more, your private nursery and primary school will be patronized by very many Nigerians. Let’s do a feasibility study using the nursery and primary school my 2 year old daughter attends in Abuja. Counting from their pre-nursery to their primary classes, this Montessori has about 200 pupils. Now my daughter’s school fee is about N200, 000.00 per term for pre-nursery. If 200 students are to pay N200, 000.00 per term, that will be about N40, 000,000.00 per term and 120,000,000.00 a year. No matter how expensive teaching equipment are in the market and the cost of fuel, the proprietor of this school will not spend up to 10 Million Naira in running the school for a year. Now you can see that investing in private nursery and primary school business is a lucrative venture with profitable returns? 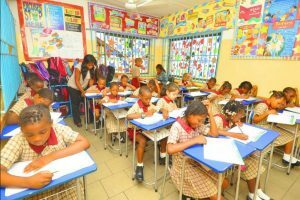 If you are ready to get started, here are the requirements for starting a private school in Nigeria. How much money do you have to set up the school? After payment, send your full name, email address and topic (i.e. nursery and primary school business plan pdf) to 07033378184. Your business plan will be forwarded to your email within 10 minutes of payment. If you can afford it, get land in a good area and build the school structure. When I say “good area”, what I mean is in an area that is not far from your targeted customers. Somewhere in town will do. No parents will want to travel all in the name of doing school run or will they patronize your nursery and primary school if you situated in an isolated area. If you do not have enough money to buy land and build, you can rent an apartment till you have made profit to build a permanent structure. Remember that your facility should cover the following key areas: classrooms, playground, toilets, library, computer lab, clinic, security house and offices. Make sure that your classrooms are spacious with proper ventilation as that is one factor parents consider before enrolling their wards. To maintain a clean environment and hygiene among pupils, you should install a borehole system that will supply clean water at all times. Apart from the regular chairs and tables, you will need to equip your school with the right learning aids for all ages and stages of growth. For example, kids in pre- nursery and nursery classes will need a lot of learning aids like large screen TVs and DVD players to play educational videos, building blocks, etc. Stock up your library with the right kind of books and educational materials. Buy a good number of systems for your computer lab so that your pupils will start becoming tech savvy at an early stage in life. Who was their last employer (if any). Why they left their last job. If they ingest or abuse any substance (Do a drug test). Their affiliations and religious background. Do not assume anything when it comes to employing someone that will work with or around children. This is because we have heard of cases where children are being physically, mentally, emotionally and sexually abused by teachers, cleaners and security agents employed to work in their school. We have also heard of cases where kids are kidnapped from school with aid of an insider working within the school premises. You wouldn’t want that to be the case in your school as that can ruin the reputation of your school forever. That said, make sure that your teachers are well trained and have a National Certificate in Education (NCE). As it is common knowledge that most NCE holders cannot deliver quality teaching in classroom, you are mandated to test your teachers before you hire them. Other qualities that are expected of teachers is that they should be passionate about children, multi-tasking and have an eye for detail. Like every other business, you will need to register your private school at the Corporate Affair Commission of Nigeria. This will enable you to operate your business without fear of breaking the law. Remember that if your school gets a bad name for not registering as a corporate entity, you stand the risk of having your premises shut down and your students leave to your competitors. Businessplan.com.ng has an in house lawyer who can help you register your school within the shortest time possible. Contact us at 07033378184 and we will help you register your business with the CAC Nigeria. Send the word out! Let everyone know that your nursery and primary school is up and running. Advertise on your local newspapers, social media, email blasts, etc. Put up posters and handout pamphlets and your business card. Join school associations as this will help provide accreditation and recognition. Set Resumption date and resume! After payment, send your name, email address and title of business plan (i.e. private school business plan pdf) via text to 07033378184. Your business plan will be sent to your email within 10 minutes after payment. Thank you. Thank you so much Tochi, but before I could pay, I would like to create an avenue to detail you on school business plan you will write for me. Thanks for the write up Tochi, is the business plan fee negotiable?